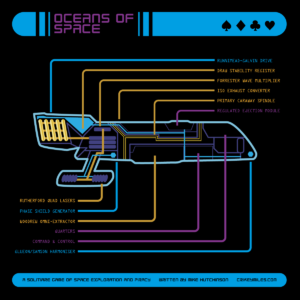 Oceans Of Space is a solitaire game of intergalactic p iracy, that requires only a pack of regular playing cards, a printed record sheet and a pencil to start your new career as an intergalactic rogue trader and pirate. You will visit a multitude of planets, mine for precious ores, and adventure for great rewards. 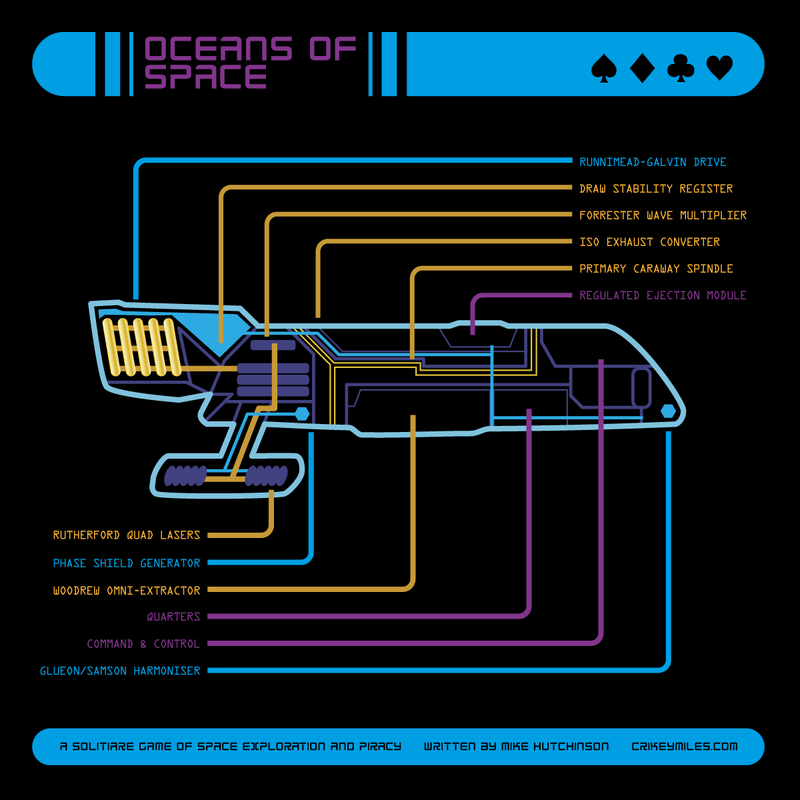 The objective of Oceans Of Space is to retire in with 10,000 credits. If you have 10,000 credits and are in a port, you win! If you ever reach 0 hull, you are destroyed and the game is over. Each turn you will either visit a port, mine for minerals, or engage in piracy. Visiting a port will allow you to buy and sell goods, discover and buy upgrades to your ship, pick up passengers, or accept missions or contraband goods. You flip a card to discover which type of good is highly valued at this port, and flip further cards to reveal what ship upgrades are available to buy. Mining sees you flipping cards to uncover diamonds, pushing your luck for a big haul or a precious gem. Piracy sees you gambling against the game, with the possibility of winning big, or having your game suddenly ended in ignominy. Your first few turns will be a struggle to survive, but with the right choices and a bit of luck, you’re be navigating the oceans of space to your fortune in no time.